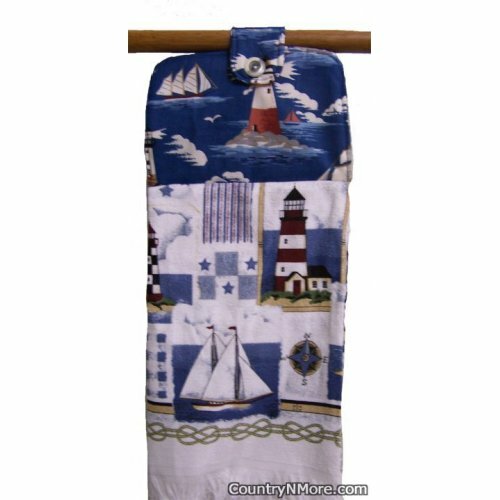 This lighthouse and sailboat oven door towel is made from a lighthouse kitchen towel. The kitchen towel has a lighthouse shining its lights to guide the nearby ships. This oven door towel is perfect for the sailor in your life. The bottom of the towel has a fringed edge.This oven door towel will cheer up the kitchen, and it is the perfect gift item for a friend, loved one, or just for yourself. This towel is designed to fit over the oven door handle. You will know where to find your towel the next time you want to dry your hands. The top has a layer of thermal batting.Made with 1 full towel, rather than half towel used for other oven door towels sold elsewhere.I have other similar oven door towels listed on my website, but since each one is unique, I have listed them separately, so that you know what you are buying.